Goodgod are ecstatic to be hosting Nobunny’s return to Australia this August! The leather-jacketed, rabbit-masked bandit with no pants is bringing his wildly fun spazz-trashpunk back to our shores on the heels of his third album, Secret Songs, released late last year on Goner Records. 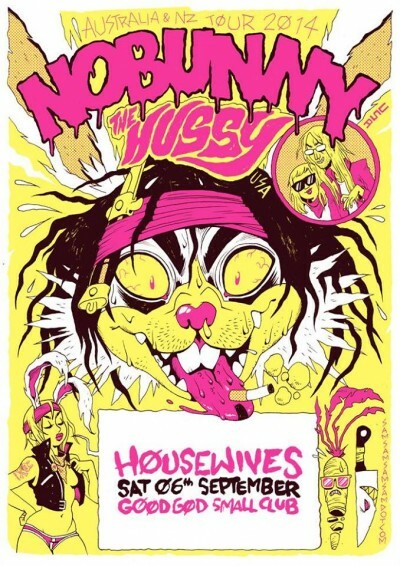 Joining him for the ride this time are The Hussy, a psychedelic two-piece punk combo from Madison, Wisconsin. They have three albums in the can, praised by the bigwigs at Spin and Pitchfork as well as the likes of Terminal Boredom and MRR. Their fourth album, Hussy Galore is due later in the year on South Paw Records.